Alberto Vega is the Latin America regional manager for BitPay. The economic prospects for Latin America in 2016 are grim. With political instability in some of the region’s largest economies, as well as a general slump in prices in oil and other commodities, businesses and consumers are facing a depression and, in the case of Venezuela, economic collapse. The crash of the Chinese stock market has severely hurt the economy, as well — China is the No. 1 commercial partner for several countries in the region. Many Latin Americans are turning to bitcoin as a solution, and the recent crises seem only to have accelerated adoption. Last year, adoption of the digital currency broke records in Latin America. Payment processor BitPay reported a 510 percent gain in merchant transactions in mid-2015, but the most notable growth took place toward the end of last year. Latin American merchant transactions finished the year having grown by a staggering 1,747 percent from the beginning of 2015. Other key figures from Brazil’s bitcoin ecosystem showed bitcoin exchange trades surging by 322 percent and bitcoin wallet adoption growing 461.4 percent. Exchange trading in Mexico grew by 600 percent in 2015. In Latin America, the country most known for bitcoin is Argentina. And while Argentina has had the most bitcoin enthusiasts per capita, that may be starting to change. Brazilians and Venezuelans also have good reasons to adopt bitcoin — bitcoin holders in 2015 enjoyed earnings during 2015 that performed more than 400 percent better than the Venezuelan Bolivar, more than 92 percent over the Brazilian Real, more than 65 percent over the Mexican Peso and more than 41 percent over the Argentine Peso. The crisis facing Latin American economies did not begin in 2016. Argentina, Venezuela and Brazil ended 2015 with serious economic problems, including huge inflation rates — as high as 275 percent for Venezuela (63 percent for 2014), ~30 percent for Argentina (36.4 percent for 2014) and 10.4 percent for Brazil (6.3 percent for 2014). The problems started in previous years, and administrations are continuing to impact these economies. 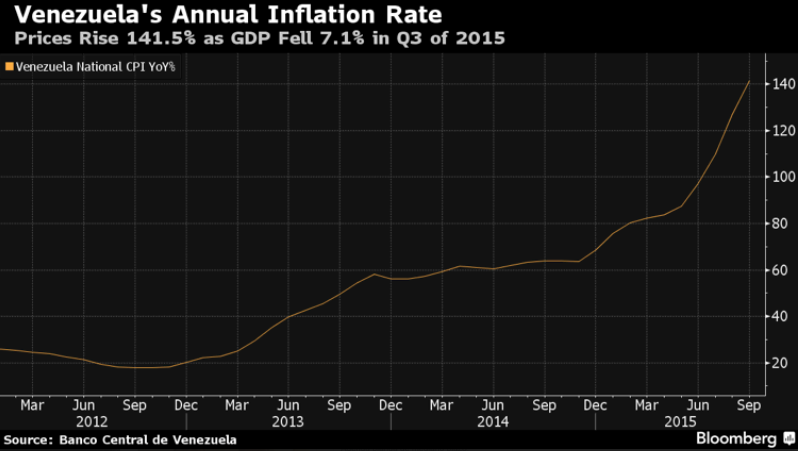 The International Monetary Fund (IMF) predicts a 720 percent inflation rate for Venezuela during 2016. The Brazilian economy has entered a recession that, according to the IMF projections, will be the longest since 1930-31. Argentina’s Minister of Finance in Argentina predicts a minimum of 25 percent inflation, and analyst projections estimate that 2016 inflation could be as high as 38 percent, with a 30 percent devaluation of the Argentine Peso against the U.S. dollar. Latin America stands out as a land of opportunities for bitcoin in 2016. As the crisis deepens in Latin America, some governments are tightening capital controls. The Brazilian government has announced a new tax over the payments sent out of the country (including remittances, tourism expenses and other services) that increases costs to 25 percent (and up to 33 percent). There are other major problems for businesses and consumers making both cross-border and local payments: settlements can take weeks and cost more than 10 percent. Bitcoin has proven to be a solution for many of the problems caused by inflation and subsequent capital controls. And while workers and merchants have turned to bitcoin first as a hedge against devalued local currencies, the technology is beginning to find a number of practical applications as a payment method. As a universal currency, bitcoin has allowed consumers to shop and send money internationally. From Apple to Walmart, international businesses that might not accept local payment options from Latin America can use bitcoin to continue to reach online shoppers in the region. Bitcoin may help Latin American tourism weather the current economic crisis. Because bitcoin can be used by anyone with an Internet connection, it can reduce foreign exchange costs for both tourists and merchants. Because tourists from Latin America often don’t carry credit cards, bitcoin may be a way for popular tourist destinations outside the region to reach more customers. Latin American companies sending payroll payments to international workers can benefit from faster, simpler payments without the costs and delays of wire transfers. Exxon Mobil employs more than 1,500 people in Argentina, so bitcoin may offer it and other international oil companies a way to more easily send money to payees in Latin American countries. Online marketplaces like OPSkins have already seen massive success using bitcoin to send payouts to international vendors. Marketplaces like eBay (which moved into the region in 2014) and Amazon may find bitcoin to be the best solution for payments for Latin American buyers and sellers. With capital controls, it has become difficult for businesses to pay money to suppliers and corporate offices outside Latin America. Franchise businesses like McDonald’s and KFC may find bitcoin to be the ideal way to pay franchise fees and other supply costs in a continuing economic crisis. Though Latin American importers can pay for shipments upon delivery, long delivery periods can expose them to the risk of currency value fluctuations. Multinational corporations with subsidiaries in Argentina can turn to bitcoin to reduce those costs dramatically. While many Latin Americans do not have access to credit cards, services like Belize’s Advanced Cash offer consumers debit cards and e-wallets that can be used with merchants that accept major credit cards. Bitcoin has offered an affordable way for consumers to top up these accounts without bank transfers. Because bitcoin top-up payments can be sent from anywhere in the world, they also can be an immediately practical way for Latin American consumers to receive remittances from outside the region. While it may seem like an unlikely success, bitcoin‘s growth has a precedent in Latin America’s rapid Internet adoption. While the share of web users in Latin America is still small compared to that of developed countries, the region’s e-commerce volume has climbed to nearly $50 billion (~24 percent year-over-year growth). The region’s social media users almost quadruple its share of web browser users, showing how important mobile e-commerce and social networks are becoming for the general population. Although bitcoin usage is growing rapidly in Latin America, it still faces several obstacles. Since 2014, Facebook, Twitter and WhatsApp have been the main networks that have benefitted from that growth in Latin America. Latin American users make up 38 percent of WhatsApp’s user base, while Latin American users make up 20 percent of Facebook’s global user base. Argentinians and Brazilians are among the groups that spend more time on social media networks than anyone in the world. As more Latin Americans become used to the freedom and global connection that web technologies like social media provide, bitcoin will continue to be an attractive alternative to payment systems built for a pre-digital world. The election of Argentina’s new President Mauricio Macri represents a political shift in Argentina after 12 years of government by the Kirchner family. Macri’s government has already shown signs of welcome for bitcoin adoption. 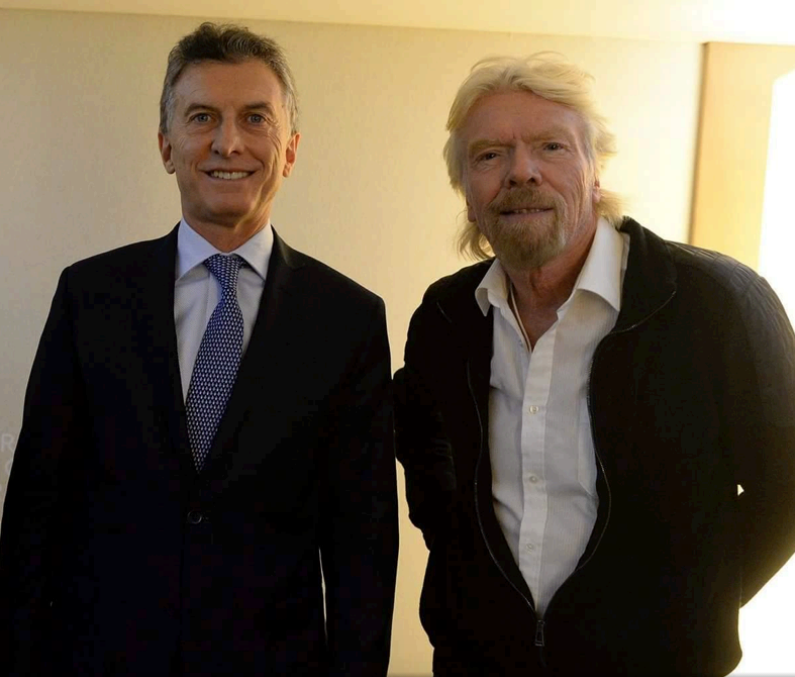 Macri is dubbed in Argentina as “President Facebook” because of his social media presence, and it was through his Facebook profile that he talked about his meeting with BitPay investor Sir Richard Branson, naming bitcoin as one of the most interesting activities of the billionaire. The bitcoin buzz in Argentina also hasn’t gone unnoticed by local politicians. It was the country’s youngest mayor Martin Yeza who tweeted that his mid-term agenda will include bitcoin implementation and regulatory approval for the popular ridesharing platform Uber. Embracing bitcoin would be a big step forward in the path toward the economic freedom objectives of this government, which has already ended the “cepo” capital controls created by the former administration. Macri’s government has also announced the softening of import-export restrictions, among other important liberalization efforts. While it isn’t clear if the Brazilian and Venezuelan governments will respond to bitcoin in the same way, Bitcoin will be front and center in the changes the Argentine government is making to counter the economic crisis. Although bitcoin usage is growing rapidly in Latin America, it still faces several obstacles. E-commerce hasn’t yet had the same impact in Latin America as it has had in the larger markets of North America and Europe. While some Latin Americans distrust their own currencies, they’re not all ready to use bitcoin in day-to-day transactions or rely on it as a store of value. Another challenge to adoption is the friction for consumers to buy and sell bitcoin. There are few large bitcoin exchanges or bitcoin wallets in the markets where bitcoin is picking up the most steam, and transferring money to exchanges outside of Latin America is difficult. While Mexican and Brazilian users have a growing base of exchanges with Bitso, MexBT and Volabit (Mexico) and Mercado Bitcoin, FoxBit and Bitcointoyou (Brazil), Argentina and Venezuela’s exchange resources are still limited. Latin America stands out as a land of opportunities for bitcoin in 2016. It won’t be interest that drives bitcoin adoption but real need, and Brazil, Venezuela, Mexico and Argentina may turn out to be the best countries for pushing bitcoin into the mainstream.